Welcome back to our knife skill series. 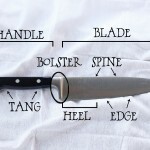 In the first part series we learned the anatomy of knives. In the second we learned about caring for our knives. Now it is time to dive into actually using our knives. Hooray! 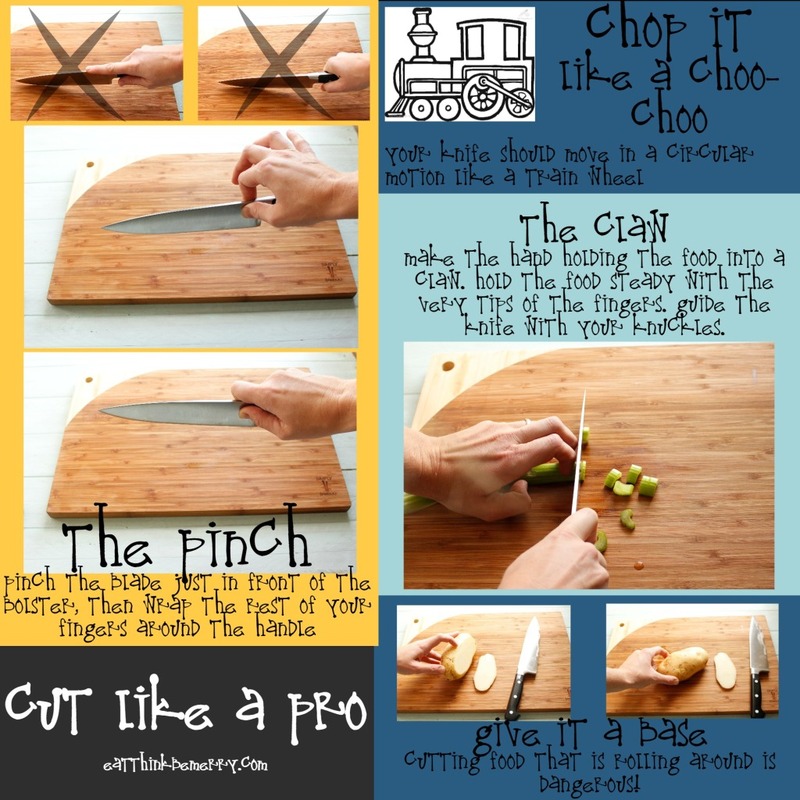 This installment is going to introduce the basics of cutting, chopping and otherwise hewing food. Before we can begin cutting, we need to learn how to hold the knife and the food safely and how to correctly move the knife. Learning how to hold a knife properly was one of the hardest things for me to get used to when I was learning to use a knife. But it makes all the difference. It felt super awkward at first, but now it is totally normal. Most people hold their knives with their hands entirely on the handle, or sometimes with their pointer finger on top of the blade. 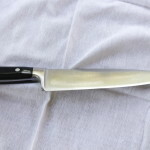 But for maximum control, you want to slide you hand forward and pinch the end of the blade, just in front of the bolster with your thumb and forefinger. Pinch the blade, just in front of the bolster with your thumb and forefinger. As so. Then wrap the rest of your fingers around the handle. Like so. 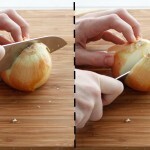 The hand that is stabilizing the food you are chopping is in constant danger, if you are not careful! This hand should use “the claw.” Your fingers should be tucked under holding the food more with your the backs of your fingernails, than with the pads of your fingers. This keeps your friendly fingers out of the way of an errant chop. You can use your last set of knuckles to guide the knife. Make your hand look like ‘dis. Then do ‘dis. Choppy chop chop. Fingers intact. Notice my knuckles guiding the knife? 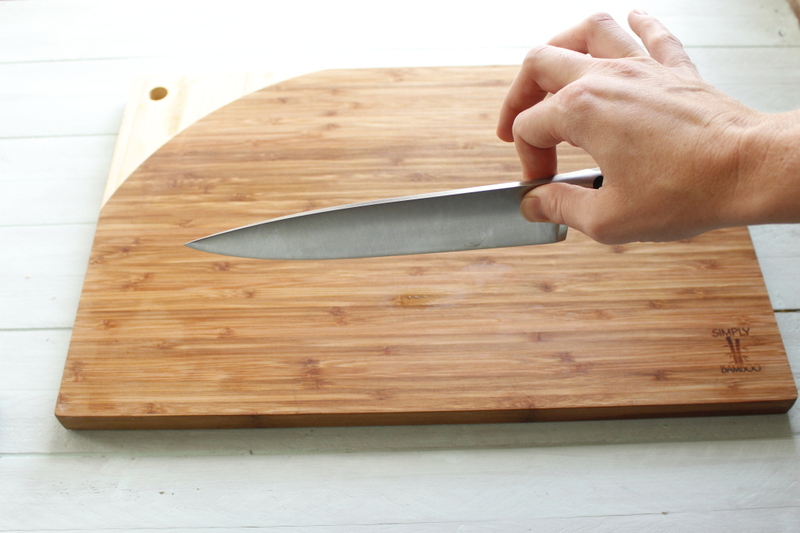 Your knife should move in a somewhat circular motion, leaving the tip of the knife on the cutting board. You will bring the heel of the knife down, while you slide the knife forward. 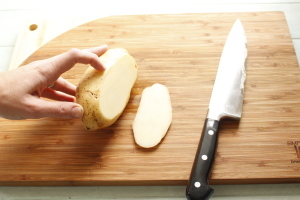 Then lift the heel of the knife, leaving the tip on the cutting board, while pulling the knife back and resetting your position for the next cut. Now this is not the way you always cut. It depends on what you are trying to cut. Obviously filleting a fish would be a different movement. 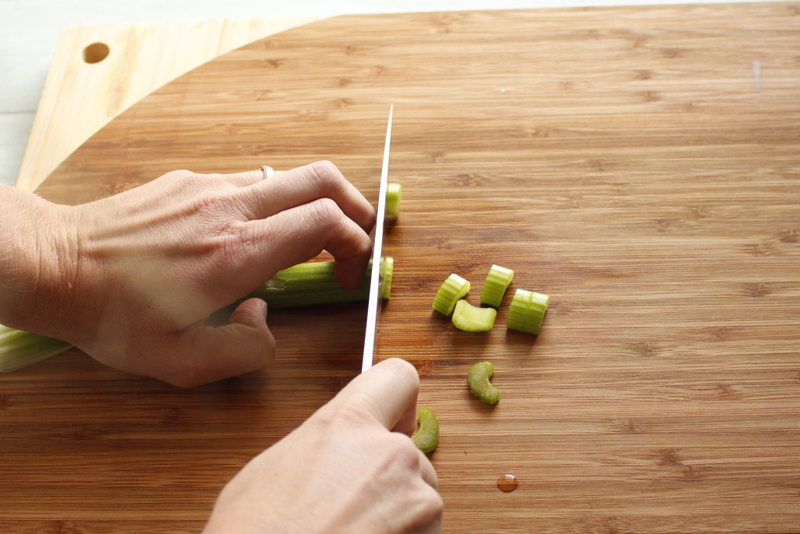 This is however, the most common way to cut most fruits and vegetables. 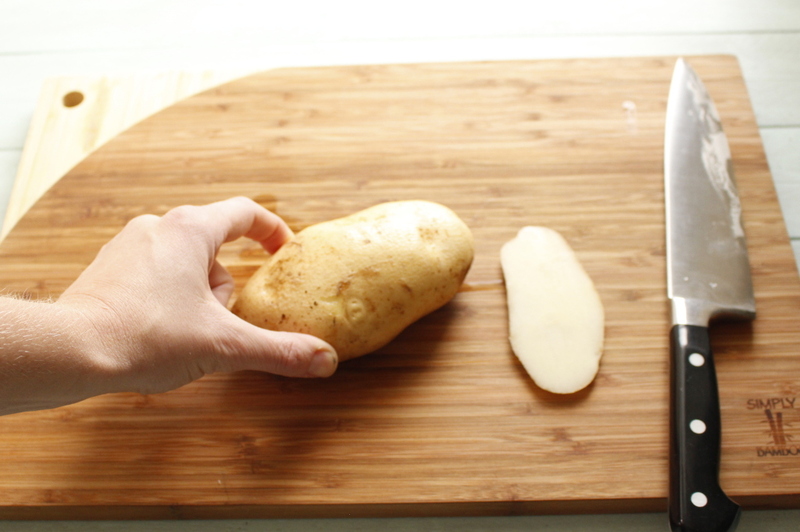 You should always give yourself a nice flat surface to set the vegetable/fruit/whatever on. Trying to cut something that is rolling around is really dangerous. And it makes it very difficult to make precise cuts. So take a little bit of the bottom of the food so that it won’t roll around. Okay. Now that you know some stuff about how to use the knife. Now you need a little knowledge about terminology*. 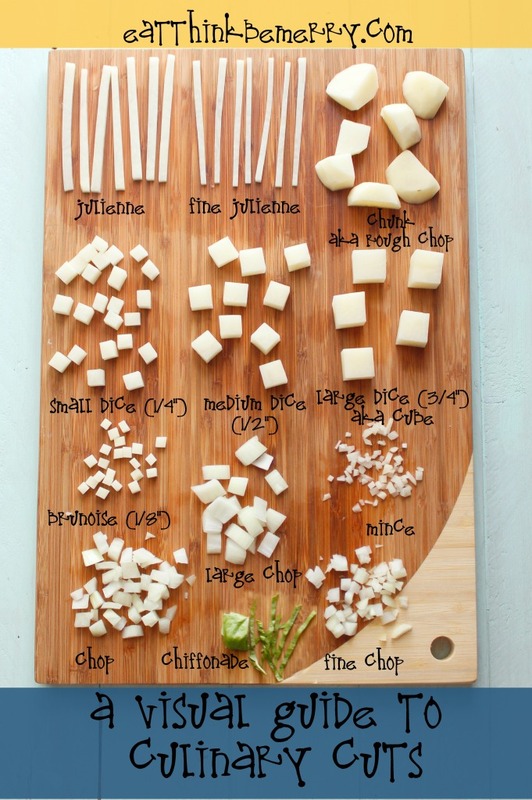 There are a lot of different words used in recipes that relate to how to cut up your ingredients. Good question. First, it helps your food cook uniformly, crazy I know. If you have very large or very small pieces the large pieces will remain under-cooked while the small pieces turn to mush. Second, because it is important for the texture of the dish. And third, it looks better. Chop- Cut into pieces. 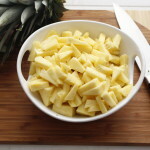 Chopping is usually medium sized pieces and doesn’t need to be exact. From there, you will sometimes hear different sizes. Onions are most always chopped. Dice- Dicing is more precise than chopping. Sometimes the instructions will give you specifications for your dice, such as 1/4″ dice or large, medium or small dice. You want little cubes. If it doesn’t give you more guidance, then I usually consider a dice a bit smaller than a chop. Smaller dices are called brunoise, but who has ever heard that in a recipe? Cube- Most similar to a large dice or maybe a medium dice. Mince- Cutting into tiny pieces. Not a particular shape, just making very small pieces. Usually used when referring to garlic or shallots. Chunk- Large, roughly cut pieces that are similar in size. Usually used when going into something that will later be pureed or mashed. Chiffonade- Rolling up herbs or leafy greens together then cutting them in ribbons all at once. *In the true culinary world, some of these terms are exact. In my kitchen it is more of a guideline. Never have I pulled our a ruler or calipers to determine my accuracy. Also some of these terms aren’t ones you would learn in chef school, but I have come across all these terms and this is my interpretation of the terms. Wow! If you made it down here, then congratulations. That was a bunch of info. Hopefully the graphics help. 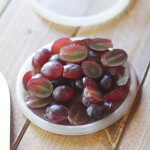 Next time, we can begin cutting specific foods. What’s the pont of “the pinch”? Why can’t I just grasp my knife handle? 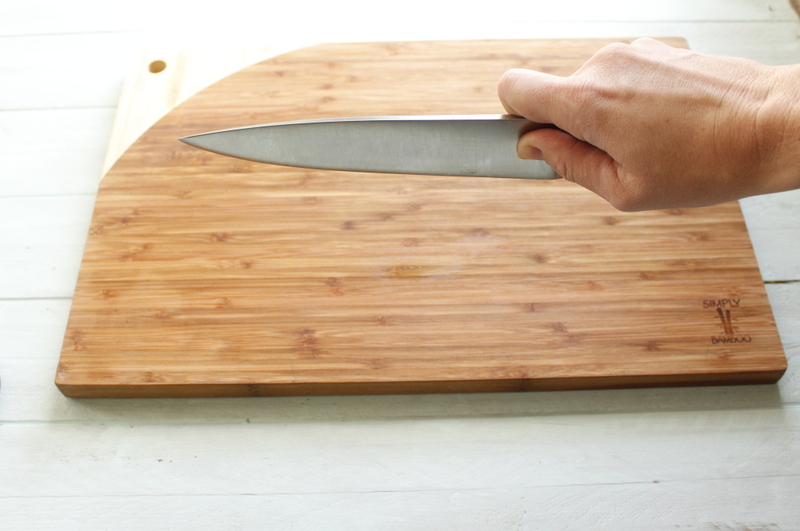 Holding it using “the pinch” gives you greater control of the knife. It moves the weight forward, closer to the axis of your chop. I tried the pinch grip today while chopping onions. I forgot the claw thing, but I still have all my fingers! It will take some time to get used to it, but I think it will work! Love the photos! I have always wondered how chefs chop things so fast without cutting off their fingers. It all comes back to technique! Thanks–I’ve learned something new and practical! I’m glad you’ve learned something new. Thanks for reading Jenny!